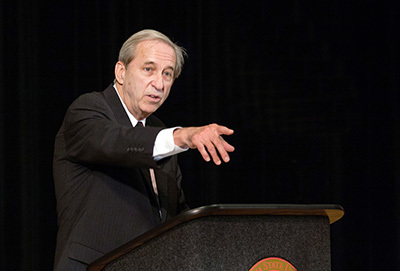 President Joseph F. Sheley gave his annual address to the campus community Aug. 27, identifying the steps being taken to improve student success and outlining plans for the new year, from developing the University’s signature and identity to enhancing health and safety efforts on campus. Sheley said that while the increasingly stable CSU budget has allowed for modest enrollment growth for a second consecutive year, the University must continue to spend wisely and strategically. Despite a mostly flat budget, though, CSU Stanislaus appears to be ascending, with no shortage of high-profile recognition, faculty accomplishments and athletic successes. In last year’s address, Sheley called for an increased focus on advising and on the foundational skills that allow students of all majors to succeed when they leave CSU Stanislaus, chief among them being the ability to write well. Steps are being taken across campus to build students’ writing skills, and there is an increased commitment to academic advising, psychological counseling and career services for students. That work will continue this year, Sheley said, with an additional effort to connect with K-12 schools to ensure students and their parents know what it takes not just to get into college, but to succeed there. The commitment to student success should be CSU Stanislaus’ signature, Sheley said, and with that signature must come easier identification of the University itself. He plans to launch an effort this year to develop a new University logo, to settle on consistent short names for the University, and perhaps to develop a tagline that encompasses the University’s mission and strengths. The result, he said, will be an increase in pride on campus and in the community. Another part of the CSU Stanislaus story must be the health, safety and security of everyone on campus, he said. Colleges across the nation are facing new regulations aimed at improving their response to and handling of sexual assault cases, in particular, and CSU Stanislaus will continue to work diligently to implement all laws and to educate students, faculty and staff about relevant policies. But even more important, Sheley said, is the sense of community and responsibility that everyone within the University family should feel. To help illustrate the point, Sheley was joined on stage by students from Warrior Watch — a program that promotes individual responsibility in helping other students who are in trouble — and members of the Student Health Advisory Committee. Be sure to update your information. Stanislaus State alumni have the benefit to participate in a variety of affinity programs. Learn more about the personal health insurance or auto, home and rental insurance benefits afforded to you alumni of Stanislaus State. ​Those not wishing to participate in the affinity programs can opt out here. Learn about upcoming events in the School of the Arts. Check out the Warrior Athletics schedule and be sure to catch a game this season! For events taking place on campus, please visit the University Events Calendar.